Promotional bookmarks are the equivalent of business cards for writers. Sure, you can still have a business card made from really cool paper stock, but bookmarks are the true mark of a writer, because they’re intended to be put in books and that’s what you do, you write books. But do they really work? And if they do, what sort of information should you put on them? In this day and age, how will readers use your bookmark to mark their page on the Kindle? Can they tape it to the screen? These are all relevant questions, but not really your concern. What readers do with your bookmark after they get it from you is out of your hands. Sure, you might stumble on a trashcan outside a writers conference brimming with your discarded bookmarks, but don’t be deterred. It’s going to happen. Really, it’s only your job to put great content on your bookmark and get it in the hands of as many people as possible. But again, what should you put on your promotional bookmark? 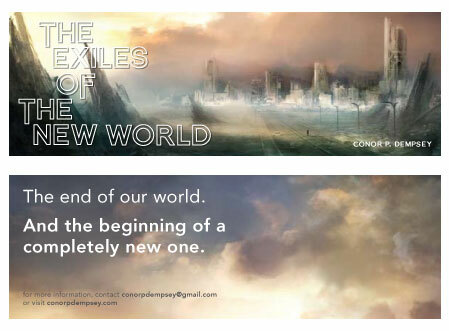 I included a preview of what my promotional bookmark for The Exiles of the New World (designed by the impossibly talented Lizelle Din) will look like as an example. You definitely want to have something to draw the viewer in, whether it be part of your book cover or some other form of illustration. If you’ve had any positive reviews from notable literary figures/reviewers, you can also include them on the front to assure people that you didn’t print this book off in your garage after watching a spirited marathon of Castle. I also wouldn’t recommend muddling up either side with a lot of copy. Keep it simple and always make sure your contact info is visible and easy to locate. This may mean trimming down your web address as much as possible and removing /blogspots or /wordpress/kittenlovers for a condensed and accessible address. No one wants to type out a novella length website to get to your book. Make it as easy as possible for them to find your product. Attention spans on the internet or otherwise are fleeting, so don’t chance it. One of the nice things about bookmarks is their price. They’re relatively cheap to order. So, if your publisher isn’t providing promotional material or you are self publishing, you can get 100 high quality double-sided bookmarks for about $25 at Overnight Prints. There are even cheaper options if you don’t mind low quality printing or single-sided marks. All in all bookmarks are an affordable alternative for marketing your book that really has no downside to trying it out. It won’t break your entire marketing budget if it doesn’t pan out. It exists as a more reasonable and economical promotional tool than services like AuthorBuzz, which might have you busking in the park for funds. This entry was posted in Tips For Writers. This entry was tagged Author Bookmarks, Conor Dempsey, Promotional Bookmarks For Authors, Promotional Materials For Authors, Promotional Materials For Authors Bookmarks. hi Conor! the bookmark looks great. i'm glad it focused on that solitary figure. some authors i know send them out to anyone interested as swags. i myself have received some in the mail as part of their book promo. Oh, oh, *raises hand and waves it frantically in the air* I want one! I really like those postcards, they'd be more than enough of an enticement to get me reading your book! Of all the promo materials authors can give out, I think bookmarks are the best. They're useful and I know I can never find a bookmark when I need one, so I end up using the water bill or something and then manage to lose it too. Or maybe that's just me. I think your bookmark design is wonderful. I can't think of a better promo for an author than a bookmark. It marks the reader's place in their current book, but also reminds them of titles of books they may want to read next and can also act as a prompt when discussing/recommending books to friends, etc. Thanks, everyone! I will let you know guys know when they are actually finished and printed. I can't wait to bike around the city scouring for bookstores I can drop them off at. Should be fun. 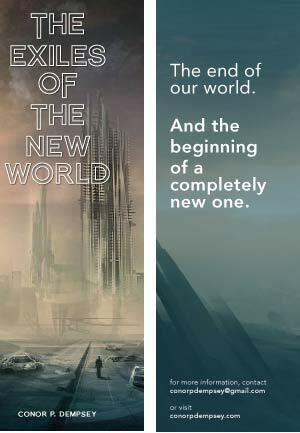 Anyone else have bookmark designs they're proud of? We spent some money on having bookmarks printed up and we distributed them all over, even to the Southern Literature Festival. Not one sale resulted. We decided it was easier and cheaper to go social media and publicize the book ourselves. That has worked MUCH better.